The FPA 4000/4100 is an online dual filter photometer capable of measuring the concentration of many analytes in process liquid or gas streams. 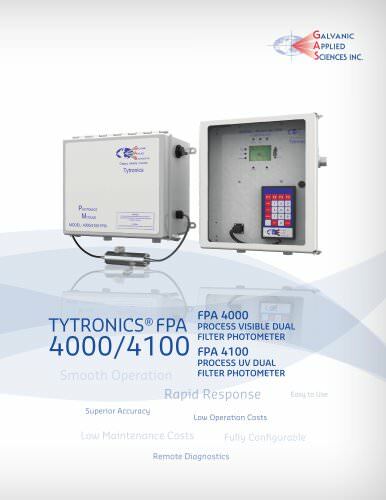 The FPA 4000/4100 uses well established spectrophotometric techniques to perform the measurement. In general, energy from a source lamp is transmitted to a measurement cell via a multi-stranded fiber optics bundle. The sample continuously flows through the cell, where the analyte of interest will absorb energy from the light source. The energy that passes through the cell is then transmitted to a set of photodetectors via a bifurcated fiber optics bundle. The amount of energy absorbed by the sample is proportional to the concentration of the analyte in accordance with Beer’s Law. The FPA uses a single beam, dual wavelength design. The energy that passes through the measurement cell is split so that it is directed to two photodetectors, one for reference and one for measure. Each photodetector is equipped with a bandpass filter such that only a single wavelength is measured. The measure wavelength is selected in a region of the spectrum where the analyte of interest is known to absorb strongly. The reference wavelength is selected in a region of the spectrum where the analyte of interest does not absorb. The dual wavelength design compensates the measurement for turbidity of the sample, optical window coating and loss of light intensity over time. Performance Range Low ppm to % levels depending upon measurement Two isolated 4-20 mA inputs to permit the FPA units to be a communication hub for other devices which do not have that capacity. Intrinsically safe keypad with 20 keys for easy menu navigation. Instrument Specifications Response Time T90 30 seconds Streams One (1) stream (standard), with up to 8 streams (optional). Auto / Manual Mode AUTO mode: analyser runs in predefined sequence. MANUAL mode: user may select any stream to run. Automatic For gaseous measurements. temperature and pressure correction Power Input Area Classification Class 1, Div.2, B,C,D CSA Field Certified Class 1, Div 1, B,C,D Type x pressurizing CSA Field Certified Electronics Dual processor design using an intelligent photonics sensor. Sensor is using 24 bit AD converter to achieve greatest sensitivity and incorporates temperature stabilization. Real time clock for accurate time required actions. Auto Zero Auto Calibration Auto Wash Field upgradable firmware. Fiberglass Enclosure (pending) Control Module 14.55” H x 12.55” W x 8” D Photonics Module 12.55” H x 14.55” W x 8”D Control Module 370 H x 319 W x 203 D mm (Nominal) Photonics Module 319 H x 370 W x 203 D mm Explosion Proof Enclosure Communications / Interface Outputs 6 - isolated 4-20mA user scalable and programmable (16 Bits of resolution). 6 - Relay contact SPDT (form C) 8 Amps 220VDC max. – user programmable. Control Module 17.38” H x 13.38” W x 8.44” D Photonics Module 16.25” H x 16.25” W x 8.95” D Control Module 442 H x 340 W x 214 D mm Photonics Module 413 H x 413 W x 227D mm 8 - Solenoid drivers –3A max. – User programmable 1 – RS-485 Serial Port (Isolated) Fiberglass Enclosure Control Module 15 lbs (6.8 kg) Photonics Module 20 lbs (9 kg) Explosion Proof Enclosure Control Module 56 lbs (25.5 kg) Photonics Module 80 lbs (36.25 kg) Windows based software for configuration and monitoring. Software includes advanced configurable features for stream switching, automatic calibration, and cleaning options. Ethernet optional All Serial Ports are MODBUS compatible. 10 Visual indicators (LED) for quick status and large graphics display. Inputs 4 Dry contact inputs user programmable 4 Wet inputs – for remote calibration etc. user programmable Memory Field programmable memory. Firmware for unit may be upgraded in the field. ISO 9001:2000 41 Wellman Street, Lowell, MA. 01851 Tel: 978-848-2701 Fax: 978-848-2713 Toll Free: 800-370-2345 REV 2.1 13211K Windfern Road, Houston, TX. 77064 Tel: 281-477-9002 Fax: 281-477-9004 www.galvanic.com PROCESS VISIBLE DUAL FILTER PHOTOMETER PROCESS UV DUAL FILTER PHOTOMETER Smooth Operation Rapid Response Superior Accuracy Specifications subject to change without notice. Fully Configurable Remote Diagnostics 7000 Fisher Road SE, Calgary, Alberta T2H 0W3 Tel: 403-252-8470 Fax: 403-255-6287 Email: info@galvanic.com Galvanic Applied Sciences USA Inc.